Colin McRae’s Subaru Impreza rally car has gone for big bucks. With 25 World Rally Championship wins under his belt, Colin McRae was one of the most legendary rally drivers who ever lived, known for his motto “if in doubt, flatout”. During his heyday in the 1990s, McRae was synonymous with a Subaru Impreza sporting an iconic blue and yellow 555 color scheme, which did wonders for the Japanese automaker’s publicity. At a recent auction in England, a Subaru Impreza WRC7 driven by the late rally legend sold for a record amount. While that means the Impreza was never used in any rally competitions, it was still put through its paces by McRae ahead of the 1997 World Rally Championship, and was also used in press events. McRae wasn’t the only celebrity to drive it, either, as the Impreza was also raced by MotoGP champion Valentino Rossi in 1999 according to the auction listing. As you would expect for a car linked to one of the most famous rally drivers of all time, the Impreza sold for a hefty price at auction, commanding 230,625 GBP which is around $300,000. Yeah, that’s a lot for a Subaru Impreza. Then again, that may not sound like a lot compared to the extortionate prices we’ve seen exotics sell for in auctions, but it did break a new record. 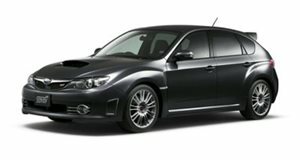 According to The Sun, this was the most expensive Subaru to ever sell at auction, breaking the previous record of $194,368.50. "Chassis 001 was the car we unveiled and used as our primary test and development car," said Prodrive founder David Richards in 2009. It was thanks to the many hours Colin and the other drivers spent at its wheel, that when it came to the model's debut at Rally Monte Carlo in January 1997, Piero Latti was able to claim victory and help Subaru go on and win a third consecutive manufacturers' title.” McRae was tragically killed when he crashed his helicopter in 2007 along with his five-year-old son and two family friends.